There came a point while I was playing Ittle Dew 2 that I realised I was over half way and hadn't yet been stumped by a puzzle – not even a head scratcher. 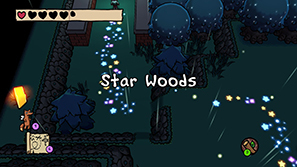 While many enjoyable mechanics from the first game are brought forwards and improved upon there are sections of the game that one can simply meander through. Ittle Dew 2 begins immediately after the first game. Ittle and Tippsie on their raft only to once again wash up on an island. Luckily, this island is also fit for a budding adventurer and her sidekick! Narrative doesn't play a big part of the game: you meet Passell, seemingly the leader on this island who attempts to discourage you from exploring. 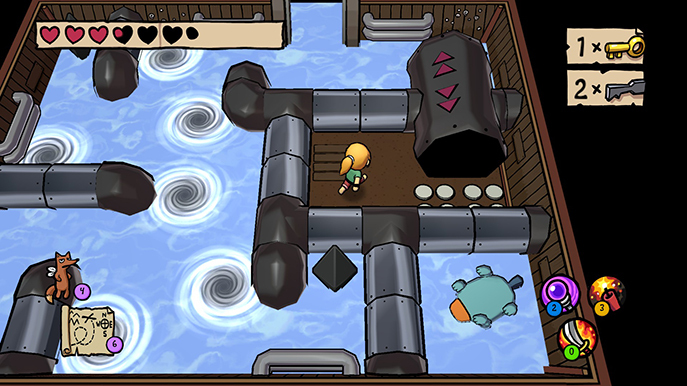 Failing that, you are tasked with finding eight raft pieces – one in each dungeon – to make your escape. The game now has 3D models rather than the 2D of the first. It suits the world well. There's plenty of colour and allows the opportunity for some nice camera angles at certain points. The locations and enemies all look great. The only part that I found bothersome was Ittle's model herself: she doesn't have a mouth! In fact, she looks almost lifeless, far from the charismatic and irreverent character we see during conversations. It just felt a bit odd – you can only see this when the camera angle changes to a lower position. There is a large overworld in which you find the eight main dungeons alongside many secret puzzle rooms. You are free to explore in any direction you desire. Every one of the puzzle rooms can be completed using just your stick. 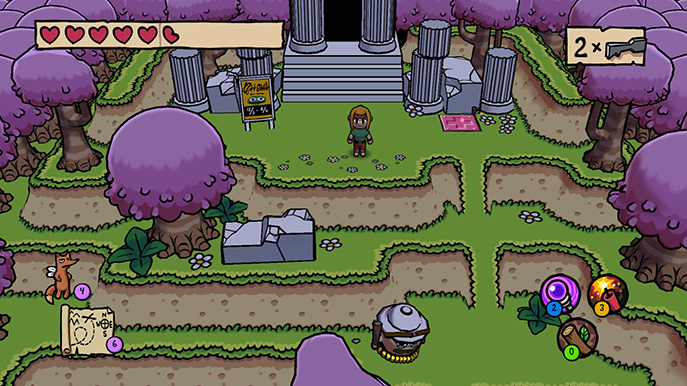 Players of the original will be familiar with the overworld – it's very similar, only much, much larger with a greater variety of locations and enemy types. This variation is welcome; there's a beach area, a western and several others. It keep things fresh and interesting as you explore. You have a map which shows a full area once you first set foot there and it includes many of the puzzle rooms as well as the location of the main dungeon. As for the dungeons, you are free to explore them in any order you desire. Of course, if you miss one of the key items from one (fire sword, dynamite to name two), solutions may be harder to come by. You do have to complete every dungeon though as there is one raft piece in each. Doing it out of order will make the earlier ones you miss easier to complete as you have more items to assist in puzzle solving. Puzzle solving was one of my two biggest issues with the game. I found every puzzle I encountered staggeringly simple to solve and breezed through the first seven dungeons without having to stop and think or take some time and explore elsewhere. I saw the room, what was there and knew what was required to advance. I have played through the first game three times now across PC and iOS and still find it to be very challenging in places. Once again, you can hit a door or blockage and the game tells you what needs to be done in order to pass through but I only used that when there was more than one door away from a room. Having said that, the eighth and final main dungeon was fantastic. It was challenging and very rewarding when I figured out the solution to each room. These solutions were quite inventive and really clever. They required you to think and experiment with each of your four main weapons; combining them in ways no other dungeon or overworld puzzle required. I really enjoyed this dungeon and feel it's a missed opportunity that there aren't more puzzles with that level of challenge in the game. I appreciate the need for a curve but it stayed easy for the first few hours without ever increasing. My second main issue with Ittle Dew 2 is the new focus on combat. 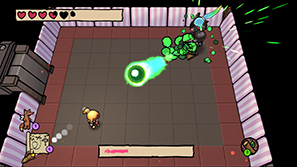 There are an awful lot more enemies in this game without the solid mechanics to help you fight. You can swing your stick/fire sword in a single motion, drop dynamite, slow/freeze and fire a projectile. Some areas have enemies with so much health you end up just standing there firing the projectile at them about ten times before they perish. It's tedious but what is worse is when you are bombarded by numerous enemies and have to use the sword. The dynamite is pretty much useless outside of boss fights and blowing up rocks to secret areas. You do have a roll this in this game with a number of invincible frames but you can get hit just as you come out of it. It felt that there was a larger concentration on combat than puzzles in this sequel where I would have hoped it was the opposite. 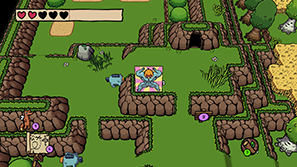 Ittle Dew is not a game I come to for the combat mechanics – it's to solve some well crafted puzzles and enjoy the humour and colour of it all. Boss fights take a step back from the first game. There was an element of puzzle solving in those; remember having to create the teleport block so the boss' projectile would teleport behind them and hit? Nothing like that here. Before the finale there are only three different bosses (you fight each more than once) and they all take place in the same shaped small room. They are also tremendously easy. I just laid dynamite down half a dozen times while avoiding their projectiles and occasionally reflected some back with the wand. The final boss had some promise but ultimately was simple (at least it was different from all the others). Despite these criticisms, I did enjoy most of my time with Ittle Dew 2. Ludosity have created a universe I enjoy spending time in (see my repeated playthroughs of the first game and Card City Nights will probably forever live on my phone) and there are many references scattered throughout this game. I like the games irreverent humour and there were plenty of chuckles and laughter from me – especially with Ittle's interactions with the inhabitants on the island. There are many secrets to discover as well which were fun little distractions. There are photo booths scattered across the world and a number of different outfits for Ittle (I ended up playing in a Tippsie onsie for most of the game). It should be noted that the audio is fantastic: suitable music to the area's theme transitions to the next piece really well. The various themes of the dungeons are quite fun – my favourite being the art museum. There were lots of laughs there with references in each of the art pieces. Ittle Dew's world is one that I enjoy adventuring around and for the most part I did enjoy the game quite a lot despite my criticisms. It's light, colourful with some fun puzzles. However, I am somewhat disappointed with it. I just wish there were more challenging areas within the game and a lesser focus on combat. It did nothing for me apart from cause me frustration when half a dozen enemies corner me and I cannot escape. While I would still push newcomers towards the fantastic first game this is a good new instalment for those that have already completed it. + Same irreverent humour known in the universe. + Bright and colourful with excellent audio. - ..but the dungeons leading up to it are far too easy. - Too much of a focus on combat which is executed poorly.